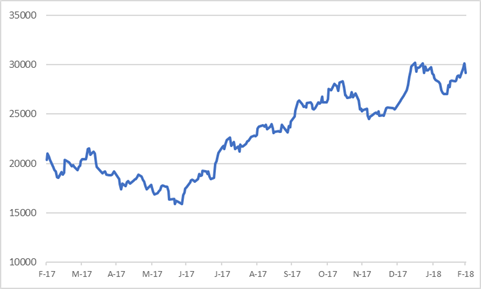 Since my last note on Anglo American dated 16 February (see “South African political tailwind”) the company has reported a pleasing set of annual results and the share price has been firm. 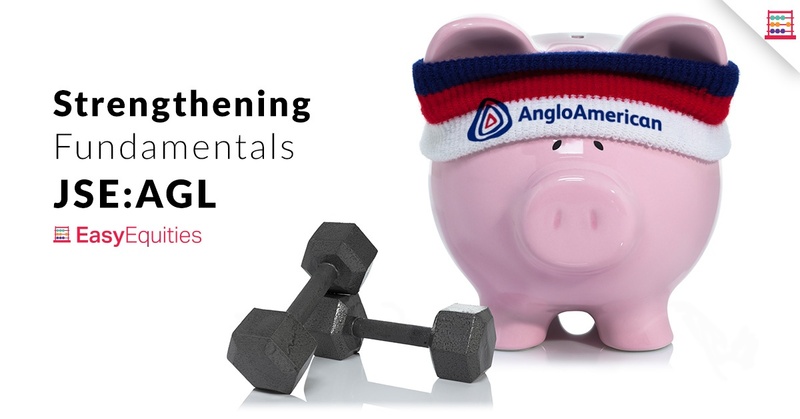 Anglo American is well set to report another good set of results in 2018, provided current demand and pricing dynamics prevail. This is despite the effects of stronger currencies in South Africa and Brazil. In addition, the more positive political situation in South Africa that I previously referred to adds an appeal that was previously lacking. There is scope for the company to pay a substantially enhanced dividend in 2018 too and I currently estimate $1,30 per share, up from $1,02 in 2017. The balance sheet is in good shape and rapidly degearing. 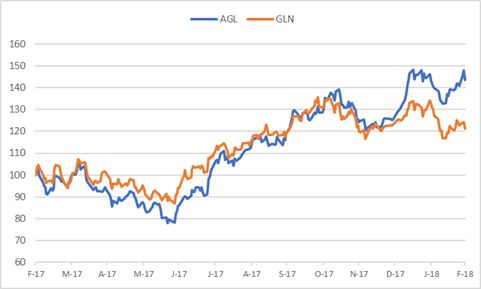 Of late, Anglo stock has outperformed Glencore on a relative basis. I previously raised the valuation due to the risk discount easing and retain the value post-results. 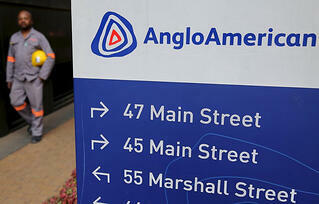 Anglo American is valued on a DCF basis at R270 and the target price is R360. Anglo American ended F2017 in a strong operational and financial position. The results too are reported in a South African political climate that has changed substantially for the better in a year. South Africa still accounts for around 40% of EBITDA so local developments weigh on the stock more than the other diversified miners. Net debt is down to $4,5 billion, around $1 billion less than my estimate. Net debt to EBITDA of 0,5x is down from 1,4x in the previous fiscal. This is due to working capital of $0,9 billion being released. Pleasingly, working capital in absolute terms will be in line with 2017 in this new financial year. The company has flagged even lower debt, possibly by $2 billion, with degearing a focus and mega deals off the table. In fact, by F2019 I have Anglo in a net cash position on current assumptions. Degearing could support a more generous dividend payout whilst having an absolute level of debt only half what it was at December. EBITDA of $8,8 billion, up 45%, and underlying EPS of $2,57, up 49%, are a large improvement on F2016 and I currently estimate a further 20% improvement in profit in 2018. Only De Beers was flat whilst all the others operations increased profitability. EBITDA margin in mining alone is up to 40% from 35% with Group margin now 31%, up 5%. The quality of the result is shown by the fact that $1,4 billion or half of the increase in EBITDA was down to internal efficiencies, including $900 million in volume and $200 million in expenses. This was higher than projected. There was a $1,1 billion headwind to profits due to currency and inflation but there was a higher commodity price tailwind, chipping in $2,4 billion. Anglo now targets at least $3 billion of additional volume and expense upside by F2022. Production guidance is down slightly and is not unexpected. Minas Rio volumes will be down too due to a delayed permit from authorities in Brazil. Capital expenditure will be north of $2,6 billion. Inflation is a feature due to the rand and the Brazilian real being stronger so 10% across the basket for F2018 seems feasible, with Minas Rio, Kumba, and platinum having the highest inflation in dollar terms. The Quellaveco copper project in Peru is being submitted to the Board by the middle of calendar 2018. This is a 300 000 ton per annum project at a cost of only $1,10/lb and life of mine spanning three decades. Against a copper price of at least $2,50/lb for the medium term the project is intrinsically very profitable, yielding a net present value of over $1,5 billion and an IRR of over 10%. As mentioned in the previous note, Anglo American’s portfolio has been underrated relative to peers and there is scope for future value uplift. On a DCF basis, I retain fair value of £16,50 or R270 and the target price at £22,00 and R360. The forward PE ratio has increased slightly since the last note due to the share price firming, but it remains attractive at 7,4x. The dividend yield, assuming a dividend of $1,30, is 5,2%. Price to book is 1,1x. The stock has had some rerating but remains underrated relative to peers. Check out Undervalued Offshore Opportunity on Rand Strength.